The other day I got the urge to read a little more about Thurgood Marshall. The Los Angeles Public Library’s catalog led me to a book by badass civil rights lawyer Jack Greenberg (read it, it’s fabulous: Crusaders in the Courts, although it’s not the book I’m recommending). That led me to look for other books by Greenberg, and thus appeared before me a book called Off the Emery Wheel which, as you can see, was published in 1935 by an outfit in Hollywood called the Cloister Press. Clearly this was a different Jack Greenberg, but nevertheless I thought it’d be interesting to take a look. The LAPL’s only copy is noncirculating, and, while a trip to the big library downtown is always nice even though it’s not plausible anymore to combine it with a visit to Grand Central Market since the goddamned-hipster-douchebag apocalypse and its associated fourteen dollar “revisionings” of the Egg McMuffin and suchlike nonsense, I didn’t really have time. However, I’ve been spending a lot of time in the stacks at UCLA, working on a historical project which you’ll read about here at some point, I’m sure (and which is at least somewhat related to the Hollywood BIDs, unlike this piece) so I thought I’d check their catalog. Well, Lo! And behold, they own a copy, which I promptly ordered up out of storage. And what a pleasant little volume to hold this turned out to be! I mean, the poetry is abominable (which is why I’m not reproducing any here), but the book itself is an object of desire. And it’s inscribed by the author as well! And note the tidy little logo of the Cloister Press! A little more poking around and I was blessed to lay my hands on a promotional bookmark from the press, which shows that it was formerly located at 1608 Cahuenga Boulevard. 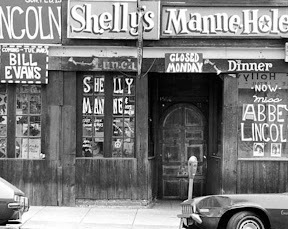 I already knew about some of the storied history of this building, formerly home to Shelly Manne‘s Manne-hole, the subject of a sidewalk historical marker, but not that there’d been an artsy literary press in there.